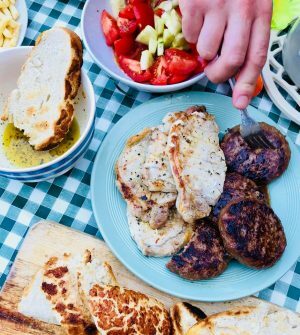 It’s summer and for this Anglo-Hellenic family that can only mean one thing: Barbecue! 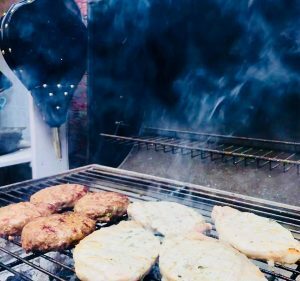 Yianni is a die hard BBQ’er, he’d be out there rain or shine (more rain in the North West than shine compared to Greece), grilling up infinite feasts if we let him. However, with weather and time often limited here in the UK the key to an easy BBQ meal is to keep it simple! Don’t over fuss with marinades or fancy dressings, just stick to the basic summer recipes. Burgers and chops tend to be a solid favourite and are easily changed up and adapted. Today we made red onion and cheddar beef burgers; using a basic burger recipe but changing up the standard diced, white onion for a red and adding grated red Leicester to the mix before shaping and grilling. For the pork chops we lightly brushed them with olive oil, lemon juice, salt and oregano. To bulk out our banquet we grilled some sliced tiger bread on the barbie; great for dipping in the lemon and oil mix (that we used to glaze the chops), we also used the same dressing to toss some chopped tomatoes and cucumbers, in a bowl for the fastest and tastiest salad accompaniment. In essence we basically create a deconstructed burger, bun and salad! For the dressing simply use 2/3 oil to 1/3 lemon juice, with 3 pinches of salt and a healthy sprinkle of dried oregano. Place everything in a shaker to mix before pouring. 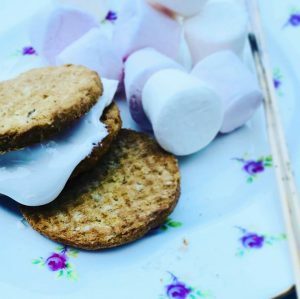 For desert we upped the lazy stakes by making Hobnob sh’mores, which in our defense are not only tastey (and perfect with a brew), but make great side entertainment-‘How do you eat sh’mours! 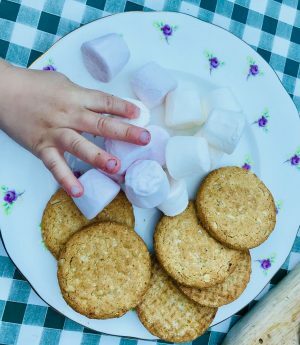 ?’ For each sh’more you’ll need two biscuits and two pieces of marshmallow. 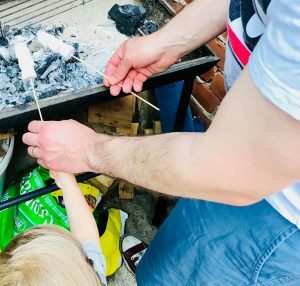 Place the marshmallows on to skewers (like sweet kebabs-you could just stop there) and grill using the left over BBQ embers. 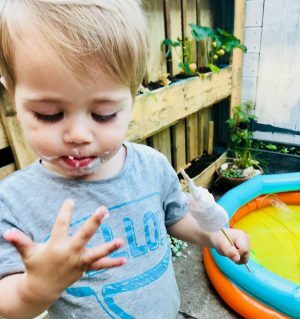 Be sure to keep a watchful eye on participating children, the combo of high sugar and excitement around the well heated BBQ is a health and safety nightmare! Once nice and gooey, place the melted marshmallows between the biscuits and squeeze slightly. If you’ve a really sweet tooth and feeling extra greedy place a couple pieces of chocolate on top of the bottom biscuit before adding the marshmallow. Be ready for a sticky, yummy, gooey mess thats worth every calorie! 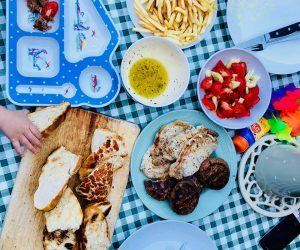 If you fancy something a bit more adventurous, why not check out our classic Greek Grills and BBQ Fish Supper Recipes. Bbq looks amazing. Isn’t it s’mores though as in some more? Love a good BBQ! Had one this past weekend too! Fingers crossed to more sunny days! I love outdoor dining and I’m sincerely hoping the weather is going to perk up again as promised this weekend. I’m sure it will, at least I’ve everything crossed in hope it will!